I’ve lived in Durham for 10 years and I hate to admit it but it wasn’t until last week that I first rode the Bull City Connector. Shame on me! I realized right then that the Bull City Connector is the most underrated way to get around Downtown Durham! Plus its FREE! The route connects Duke University to Golden Belt by following Main Street along the most popular areas of Downtown, including Ninth Street, Brightleaf, American Tobacco District, and City Center. You never have to wait too long for a BCC – they come at least every 17 minutes. While the schedule suggests that the full loop would take you 40 minutes to complete, it depends on the traffic. It took us about 26 minutes to go through the entire trip, without getting off. It is air conditioned! While it still hasn’t gotten super hot in Durham, I certainly appreciated the refreshing air conditioning. Free WiFi! Because let’s face it, while I was pretending to be a tourist in my own town, even I like to check my social media feed whenever I sit down. Clean! This may be my own bias from riding public transportation for so long in DC but I was surprised how clean the bus was. While I can understand that after a full day of carrying people the bus might get a bit messy, or when the weather is uncooperative, I saw no major damage to the inside of the bus or other concerns. Major areas are announced! Whenever I take public transportation in a new city, I always worry that I’m going to miss my stop because I don’t know what I’m looking for. The route on BCC is divided into major areas and the more touristy stops are announced. Score! There’s an app! Using the app, you’ll know how long you have to wait for the next bus. Starting at Duke’s West Campus, the bus goes to the Duke & VA Medical Centers, Duke Central Campus, Erwin Square, Ninth Street District, Duke East Campus, Brightleaf Square, West Village, Five Points, City Center, Mangum Street, Durham County Government, Health Department, Durham Hosiery Mills and Golden Belt. The route is divided into general areas. Here is a list of some of what there is to see at each one. The western end of the route has five stops along Duke’s West Campus. If you’re willing to walk some long blocks through a beautiful campus, riders are a few blocks away from Duke Chapel, Duke Gardens and the Nasher Museum of Art. So many families visit their students at Duke, former students return with their own families, sports fans, all need a reliable way to travel here from other areas of town. Duke University is a well-recognized medical facility. People come from all over the country and even other nations to receive treatment here. The BCC helps get people to and from both the Duke University and VA Medical Centers to other places in town. The area between West Campus and East Campus is a thriving hotbed of activity. Walk down Ninth Street to experience some of the best food that Durham has to offer. Brightleaf was the place to go downtown when I first moved to Durham. There are plenty of eateries and hotels in this area, including the famous The King’s Daughters Inn. If you’re visiting a student at Duke, parents this is likely to be an area where you’ll go. The warehouse area in the West Village is the location to access Amtrak and the Durham bus station. Some of the old tobacco warehouses have been transformed into apartments and offices. The stops along City Center lead you to some well-known sights. This is where you’ll go see our famous bull statue, Durham Arts Council, Carolina Theatre, and the American Tobacco Campus where you’ll find the Durham Bulls Athletic Park and Durham Performing Arts Center. If you are new to Durham and need to go set up water, trash or other services, you’ll need to access City Hall. The stops in this area also take people to the courthouse (hello, jury duty! ), the health department, social services and the main public library. The stops in this area take passengers to El Centro Hispano, Durham Hosiery Mills (now converted into subsidized housing apartments) and Golden Belt. I can’t think of a better way to go view the artists workshops at Golden Belt and enjoying Third Friday! The bus runs every 17 minutes. For the majority of our trip, which granted was on a Thursday evening around 6 pm, we were the only two passengers. In total, no more than ten people got on. I asked the bus driver whether the bus was always this empty and was reassured that others do ride during more popular times and the weekend. Apparently, the bike shares we’ve seen pop up all around town have hurt ridership. People are willing to pay the $1 to get a bike to take them directly where they want. But the bus sees its fair share of Duke students and staff, as well as patients and staff at both the VA and Duke Hospitals located on the route. I saw several workers taking the BCC to other locations where they connected to other bus lines. 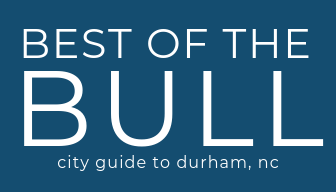 Think of the Bull City Connector as Durham’s version of a hop on/hop off bus and go explore Durham! And did I mention that it is FREE? If you’re touring Durham, or playing tourist in our city, go try it!